With Memorial Day approaching, only a week away, I thought I would post a series of photos in order to remind us of the true meaning of Memorial Day, to honor Americans who have died in all wars. Several years ago, I attended the annual D-Day Reenactment in Conneaut, OH. The event, staged in a setting which was chosen due to it’s similarity to France’s Normandy coast, served as an extremely realistic depiction of the D-Day invasion of June 6, 1944. 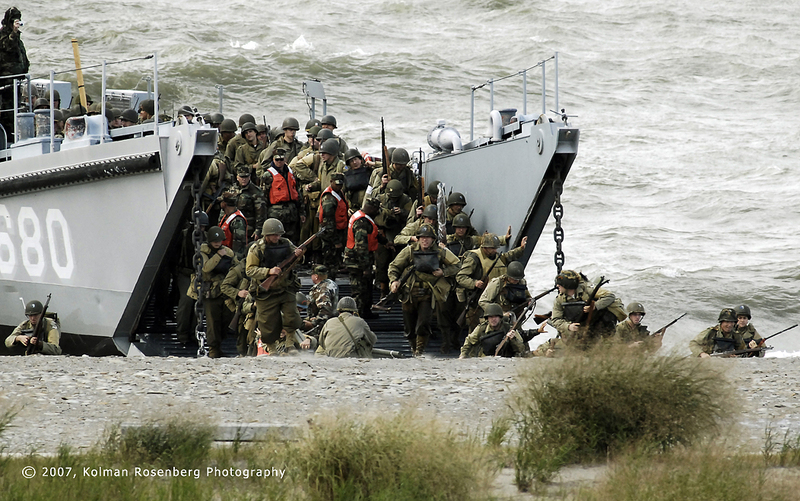 This photo shows the beginning stages of the reenactment as reenactors leave the landing craft as the battle begins. As this week progresses, I will post other photos following the reenactment and demonstrating the courage, dedication, and sacrifice of our servicemen and women who have defended our nation. This entry was posted in Uncategorized and tagged Conneaut, craft, D-Day, dedication, defense, invasion, landing, Memorial Day, military, Normandy, OH, reenactment, reenactors, sacrifice. Bookmark the permalink.